The last time I looked into the hive in Rabun County was on May 13, so the bees have been undisturbed between then and now. I drove to the mountains on Friday morning and went straight to the hive. I opened the back of my car and found that I had brought my bee-inspection bag, but I had left my smoker at home. Well, I reasoned, these are Don's bees and he works them with no protective gear, so I put on my jacket, tucked my jeans into my socks, and headed for the hive. He does, however, use a smoker and I didn't have one with me. I didn't wear my gloves, at least not at first! I opened the hive and the bees reacted as if an intruder had entered their home (Duh.....) I was head-butted and hand-butted by guard bees. OK, so I put on my gloves. Anyway, the hive was doing well. 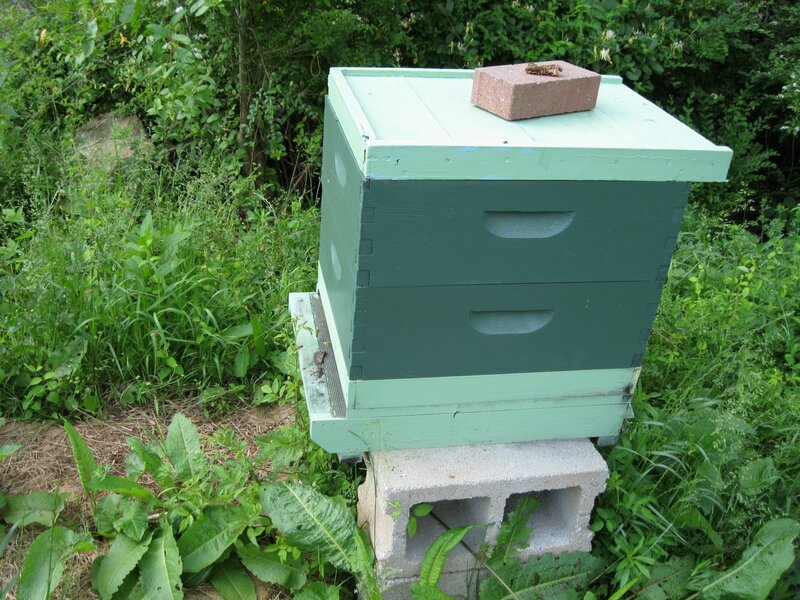 They had built out the first box and the queen was laying beautifully. I even saw her in all her regal glory (she was quite lovely) but didn't get a picture. 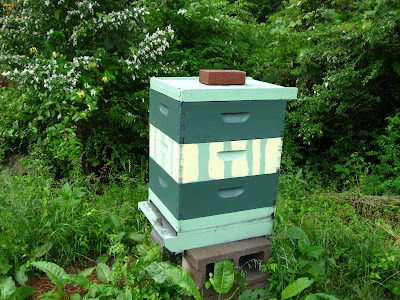 I took the empty box off of the top of the hive and put on a box I had bought from home, painted a la Julia, my beekeeping buddy, but not as pretty as hers. 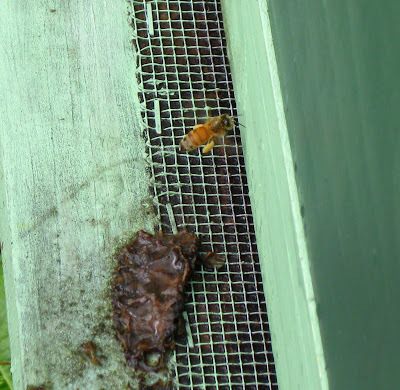 This box included a full frame of honey as well as several frames of drawn out comb from another hive. The bees were flying in and out, pollen in their pollen baskets and generally looking well-pleased with their situation. Today it was raining, but I had left the dark green box on the ground in front of the hive and needed to do something with it. 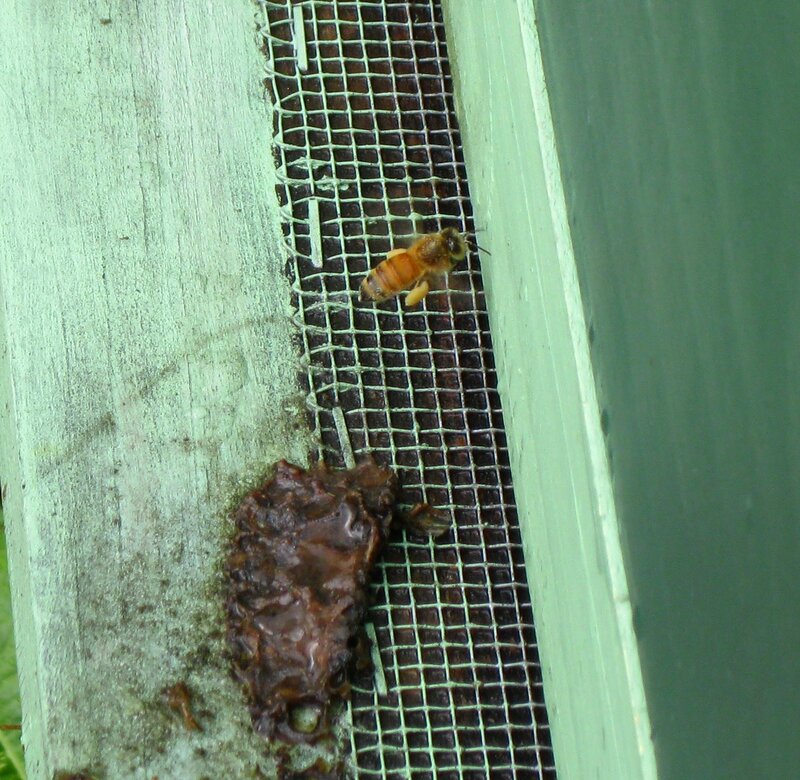 Also I had gotten a worried email from one of the community gardeners who had seen mowers around the beehive and wondered if that would have been a problem for the bees. So in the rain, I went back today before driving home to Atlanta. Now some of you will think I didn't do the right thing - I don't know if I did or not. The tulip poplar is blooming in the mountains and their nectar flow is still going, unlike in Atlanta. I can't get back up to Rabun County until the 26th of June at best. My grandson's birthday is next weekend, then I'll be visiting my daughter Becky who lives in Maryland and going to a conference in West Virginia the next week and weekend, and the following weekend is my daughter Valerie's birthday (one of the two who live in Atlanta) and my grandaughter's christening. With that many weeks before I am back up in Rabun County, I decided to put the other box on as well. I realize they may simply use the middle of both of the top two boxes rather than build the boxes up, but I would feel horrible if they needed the space and I wasn't there to provide it. At the same time, it increases what they have to defend in the event of problems from outside. So I don't know if I did the right thing or not. I left another box, outfitted with frames in the basement of my house up there. When I return on June 26, the sourwood flow will have begun and I want to be prepared for it. I am actually considering moving Aristaeus2 or Mellona up to Rabun also if they get going better through the month of June so that they can take advantage of the sourwood flow. I think adding another super was smart. Better too much space than not enough. If they go up and build some of the comb and not below couldn't you rearrange the frames at another time? 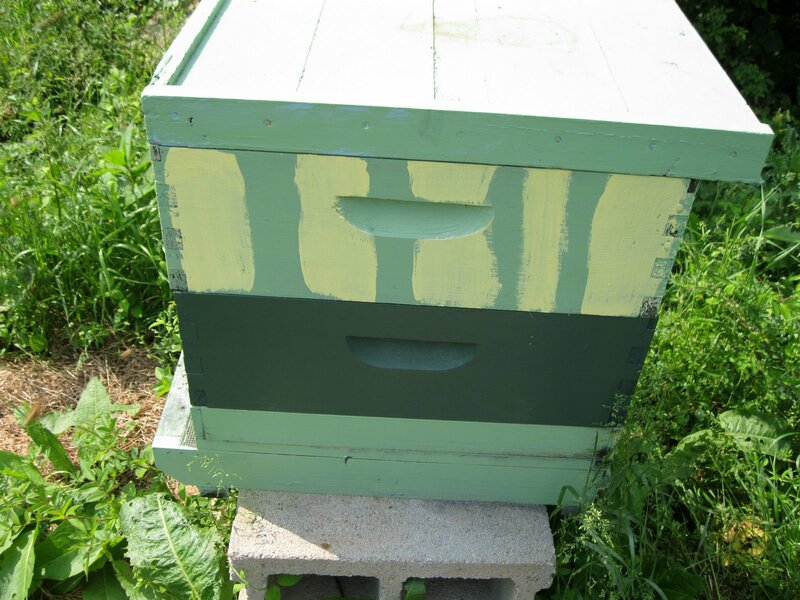 Good point I can always move all the brood - that they probably will create on the middle four frames going up - into the same box when I'm there at the end of June - it's an interesting challenge managing an out of town hive!